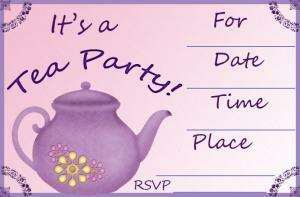 Choose or make a tea party invitation that reflects the simple elegance of this traditional party theme. The invitation can set the tone for the party and get your guests excited about the upcoming event. 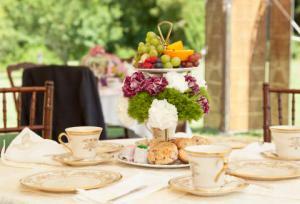 Many invites for a tea party have an elegant look to them. You can host a casual tea party, but most have an air of sophistication. Invitations can be made by hand or purchased at a party supply store, craft shop or online. Fill in the missing information and either save or print. Use heavy paper for best results. If you need help downloading the printables, check out these helpful tips. If you like to use graphics to create your own invitations, you can easily make up your own personalized template using free clip art with tea party themes. Add a border to the front of the card, and use some small images inside along with the party details. You can also add a verse, quote, or funny line or two to make the invitation special. H Scripts offers a variety of different colored tea cups and saucers. These images are very small, and would work well inside an invitation. Clip Art includes great tea images, including cups, pots, and tea bags, which you can use for free as long as you register at the site first. Shaped: Purchase a shaped invite cut to look like a teapot or teacup and saucer, or use a template and cut your own from cardstock at home. 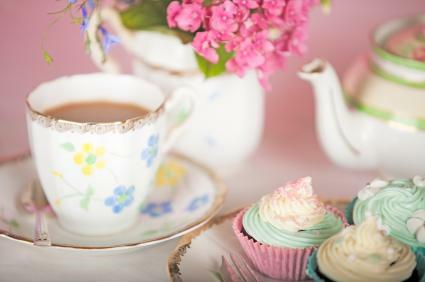 Photo: Use a stock photo or one you have taken yourself of a teapot, cup and saucer or even a full tea party table setting and use is as a graphic on the front of your invitation. If you are adept at digital image editing, consider making the photo black and white or sepia toned, with a pop of color (such as pink flowers on the teapot). Artistic: Purchase an artistic looking invitation that includes a sketch of a teapot and cup or a table setting. Some may resemble pencil sketches, while others might have the look of a watercolor painting. You can then write the details of the party inside or on the back of the invite. Victorian: Tea parties often remind people of the Victorian era, so capitalize on that aspect of the tea party for the invitation design. Incorporate lace and other elements popular to the time. Crafty: Crafty hosts and hostesses can make their own invitations using stamps, scrapbooking embellishments and even origami. In fact, you can make origami note cards that incorporate actual empty tea bags in the design. For example, if you plan to use pastel yellow table linens, incorporate yellow into the invitation. 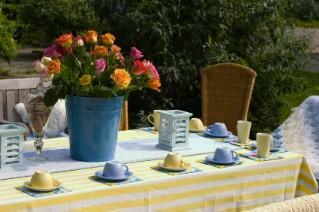 If you are hosting a garden tea party, have flowers and outdoor scenes on the front of your invite. It can be time consuming to sort through all of the available invitations that you can download and print for your tea party. Here are a few suggestions to begin your search. Hoover Web Design features a few different designs with various colors and images. You can choose a full page image, or one that can be printed and then folded in quarters for a smaller card. Child Tea Party Game Ideas offers lots of different printable invitations, mostly geared towards children's parties. Several of the designs could be used for an adult party as well. There are very specific themes here, including tea parties from around the world, and a dance tea party. The Printable Holiday offers printable templates for invitations and cards for nearly every occasion and has an adorable tea party invitation. They have a small annual fee, but it pays for itself if you send more than a few cards a year. Invites are just one supply for a tea party. Write out a little recipe for making your favorite brew of homemade tea. Print it off onto a recipe card, using a calligraphy or scripted font for the writing. Glue it to the back of the invite or inside the top of a folded card. If you are hosting a child's tea party, pick up some scrapbooking stickers with teapots, cups and saucers. Cut the stickers into small sheets and put them inside the invitation as a pre-party favor to get the kids excited about the upcoming party. 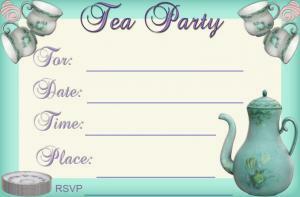 Skip the online invitations in favor of personal, mailed tea party invites. Tea parties are frequently considered a more refined party, and a mailed invitation reflects this. The invitation should also mention any special requests of the guests, including dress requirements, bringing a dessert to share and other information. Remember to send the party invitations several weeks before the event so everyone has a chance to arrange their schedule to attend the tea party.